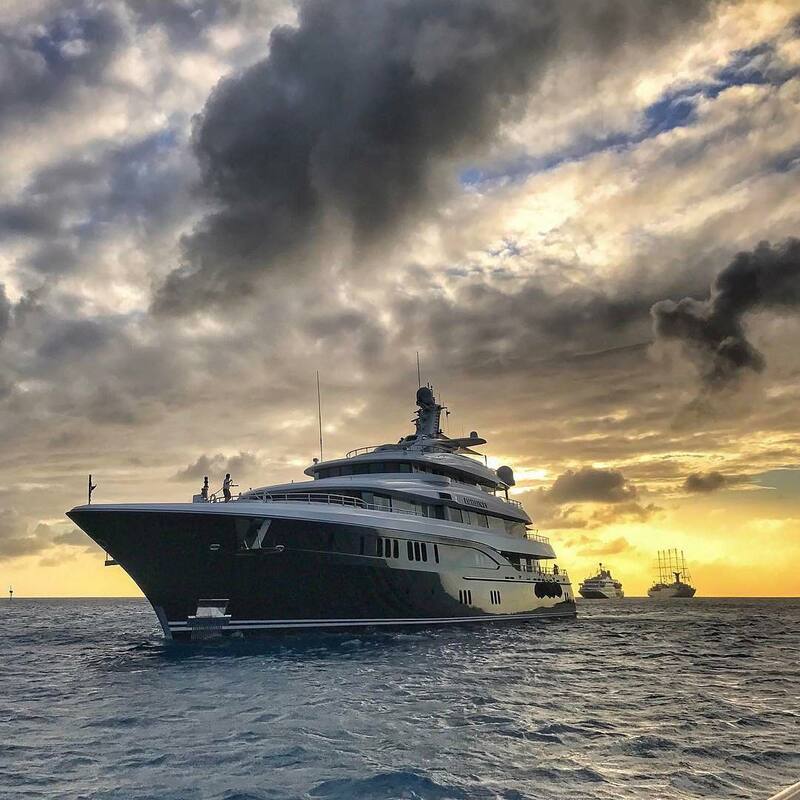 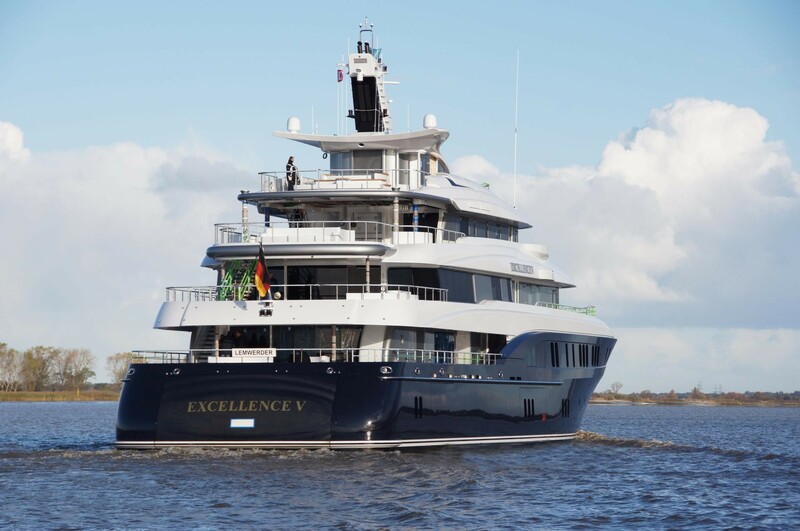 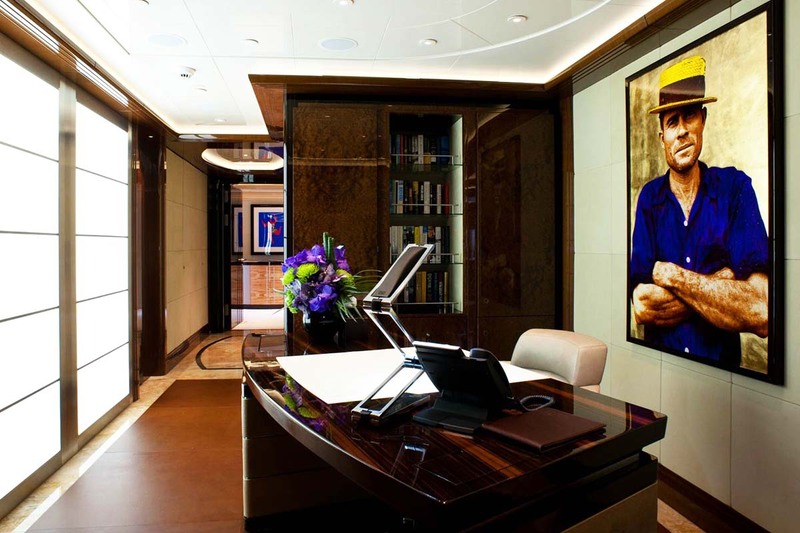 Luxury superyacht EXCELLENCE V was designed by Raymond Langton Designs and launched by German Abeking Rasmussen in 2012. 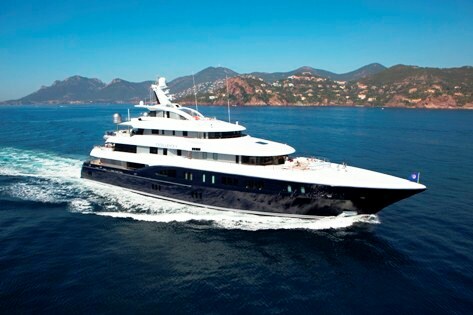 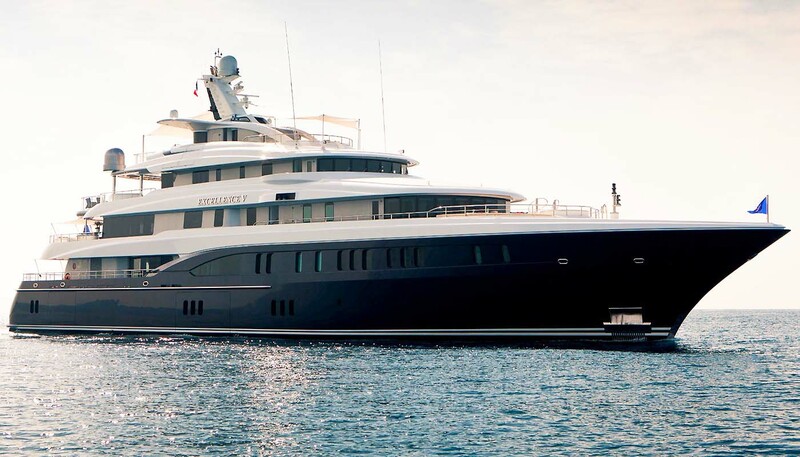 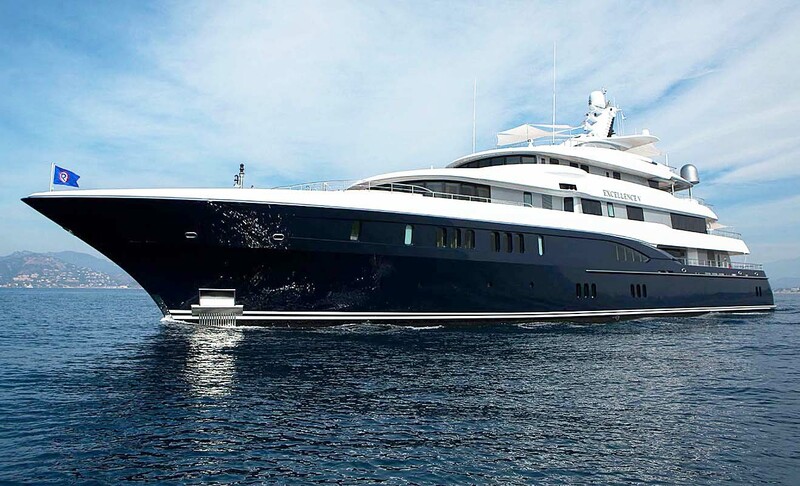 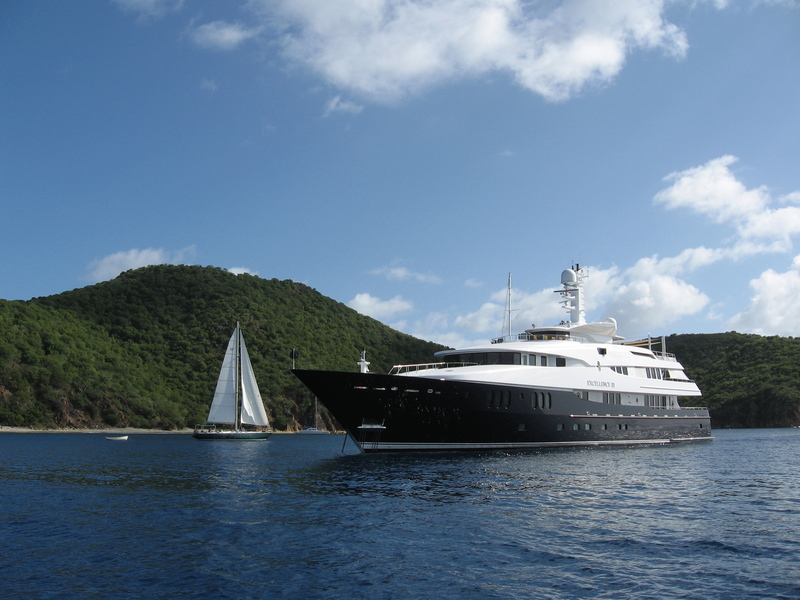 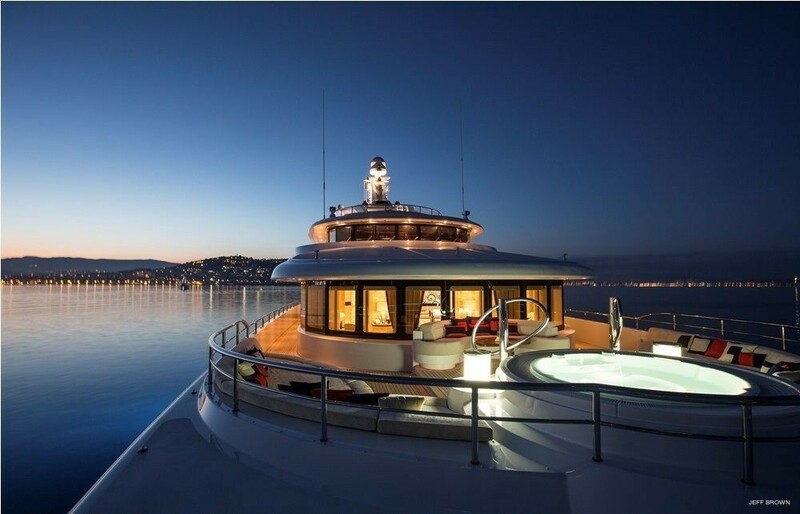 She boasts a stunning dark blue hull with elegant lines measuring 60m (196,9ft). 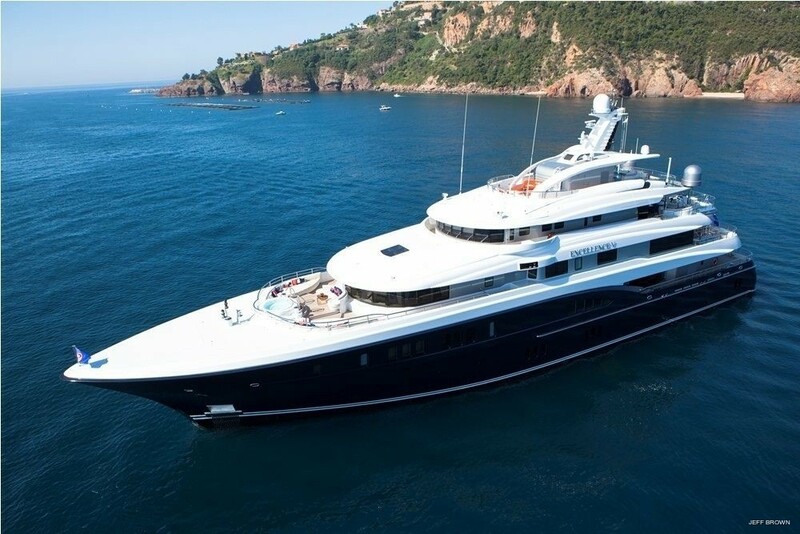 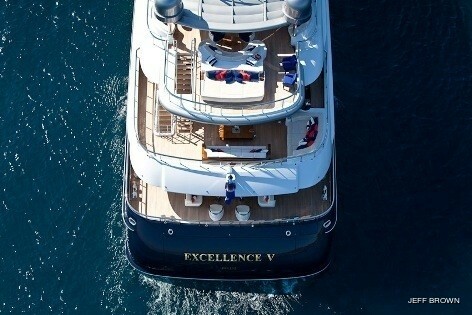 EXCELLENCE V is the largest 60m superyacht by volume at 1632 gross tons. 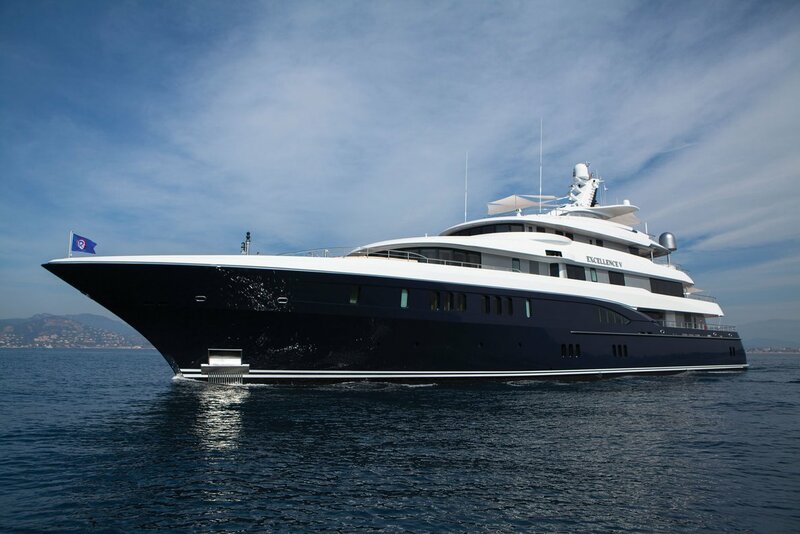 She can accommodate up to 12 charter guests in 7 deluxe cabins. 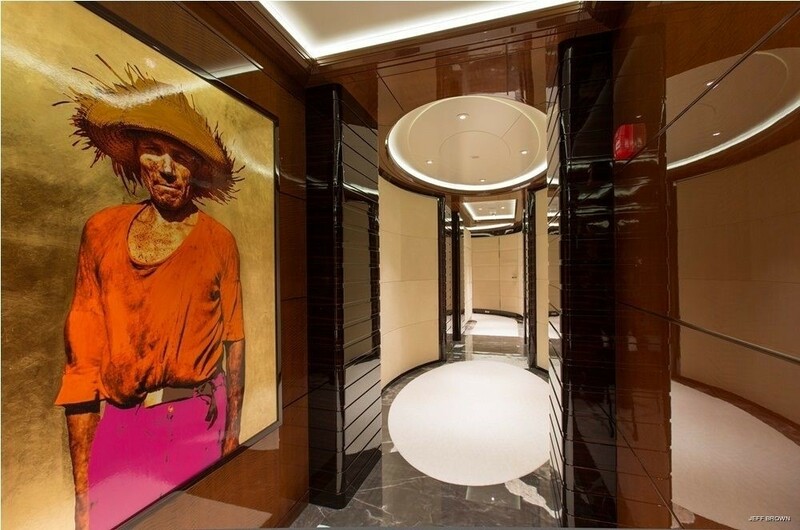 Motor yacht EXCELLENCE V has a contemporary naturally earthy toned interior with vibrant accents of colour subtly added through fine art and soft throws. 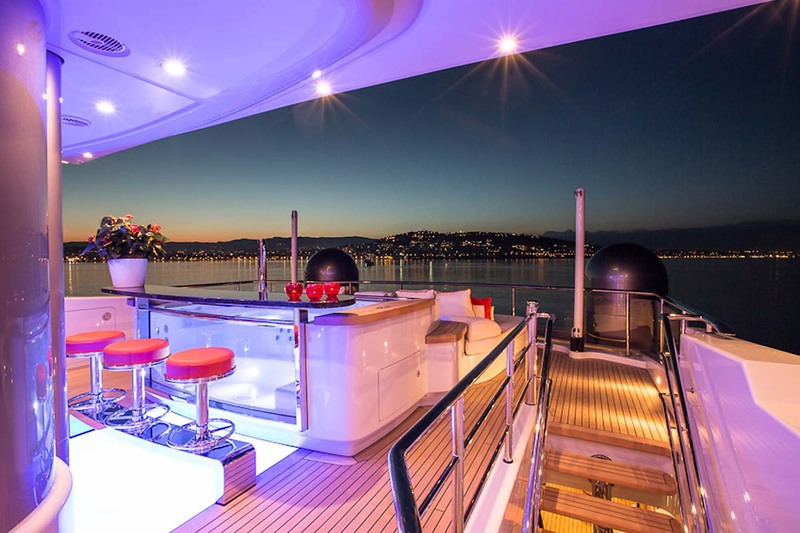 There are 5 impressive decks, a glass elevator amidships joins them seamlessly, panoramic windows on each deck ensure ample natural light and a feel of endless space are achieved. 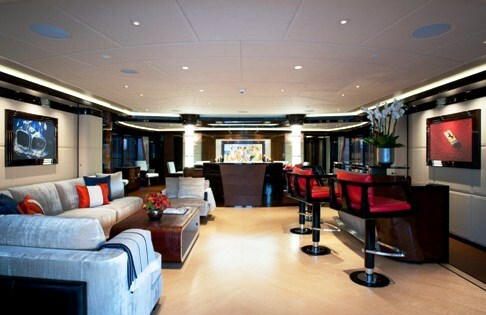 Adjoined to the aft deck lounge, entering through glass doors guests are welcomed into a relaxing lounge space featuring a plush, cool ice blue L shaped sofa, occasional chairs and complete wet bar set upon beautifully polished light floors. 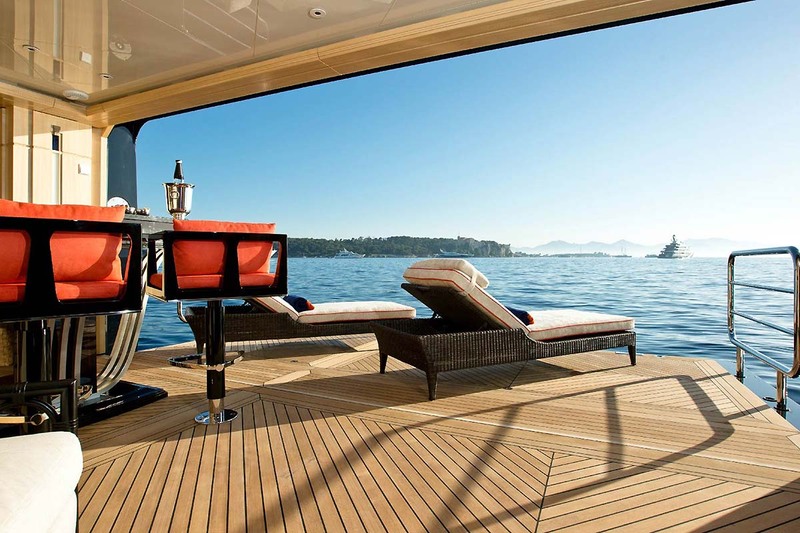 Hints of alluring reds add pizazz. Forward of the lounge, the formal dining area is separated by a credenza with pop up TV. 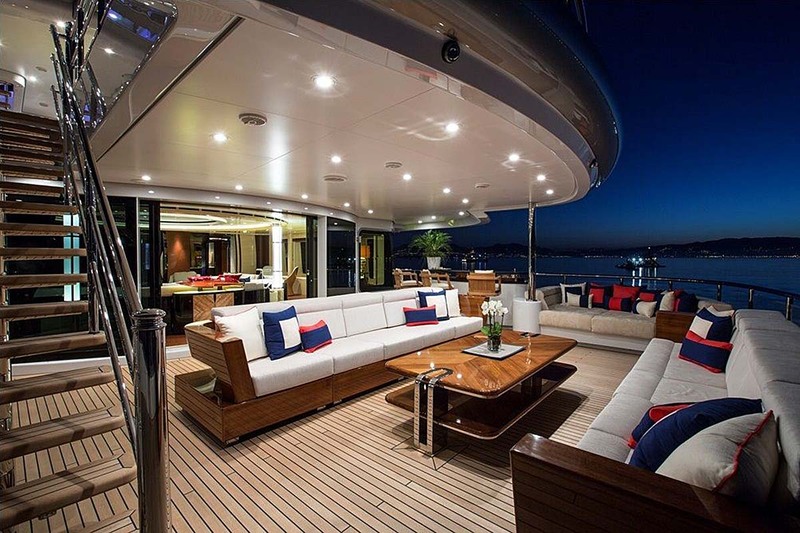 Set grandly in the centre of the space, the room is generous, boasting full-length windows on port and starboard. 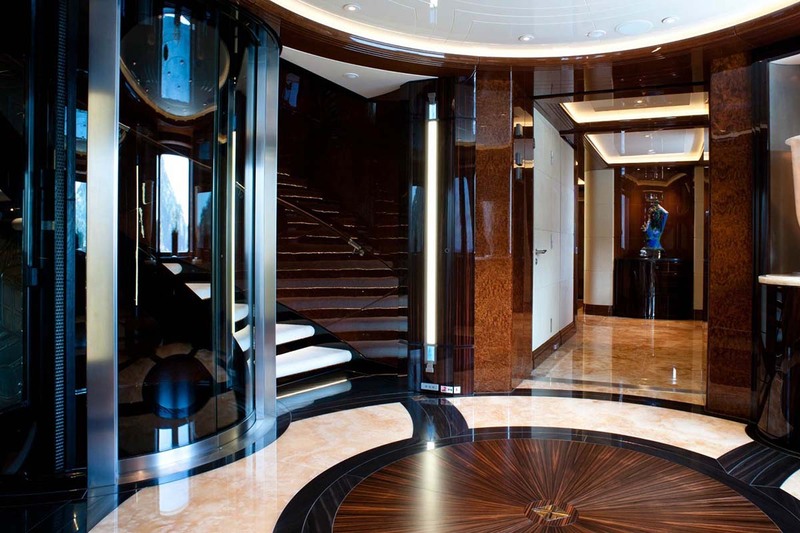 The main foyer is forward and starboard giving access to the dining and salon; a powder room is also in the foyer. 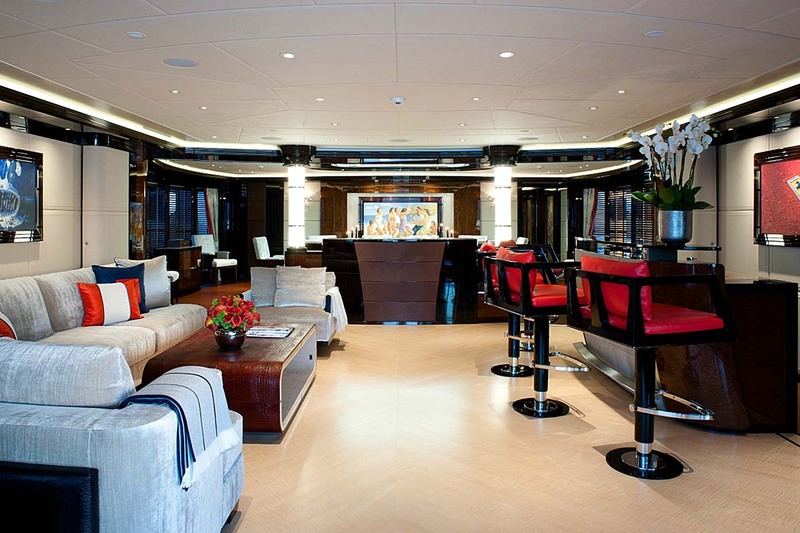 Five guest cabins are forward of the foyer on the main deck. 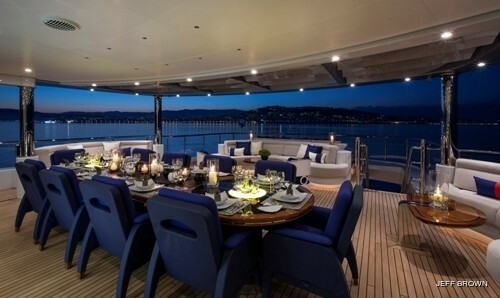 The upper deck is ideal for entertaining. 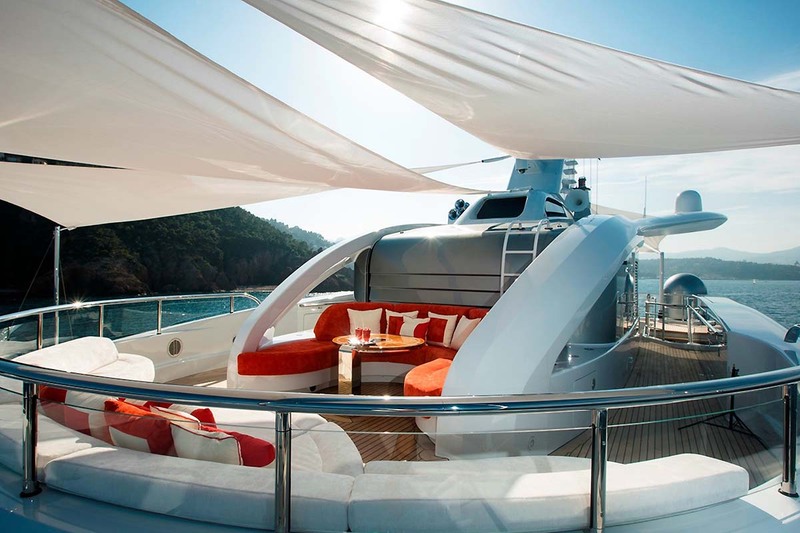 Aft, guests may enjoy alfresco lounging on partially shaded ample sofas. 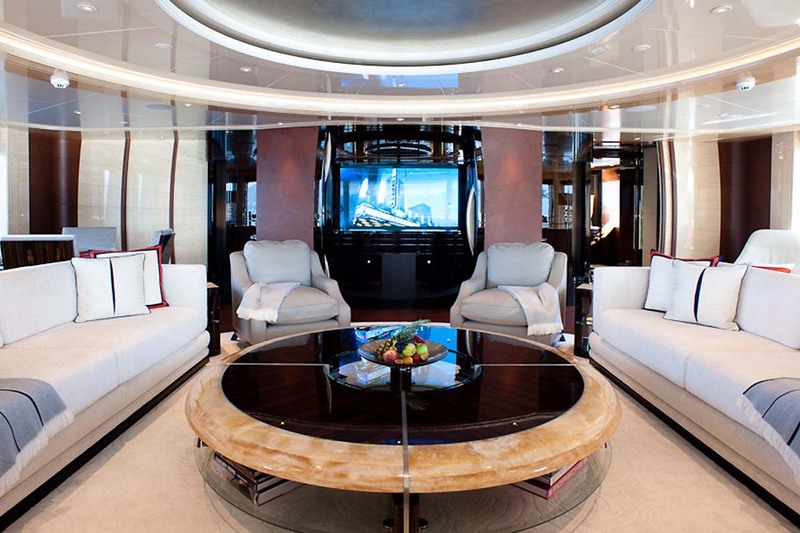 The deck continues indoors where the upper salon boasts a more relaxed feel with centred white sofas, blue occasional chairs and games tables; massive windows create an open and airy feel. The remainder of the upper deck houses the Master suite and a king size guests suite. 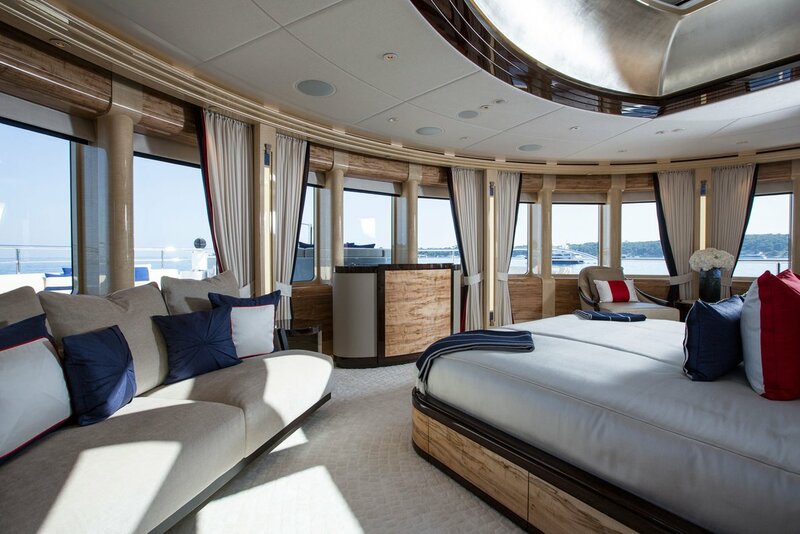 The master suite has modern, serene atmosphere with lovely light tones of creams and natural woods; the king size centre lined bed faces forward allowing panoramic 180-degree views from the wrap around windows, overhead a skylight draws in the further natural light. 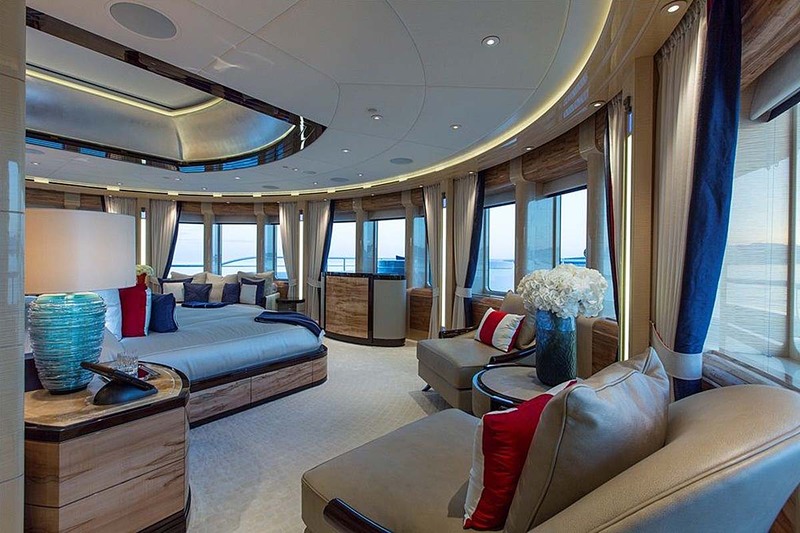 The cabin offers a large sofa, two armchairs, private study and his and hers marble facilities, each complete with Spa Pool tubs. 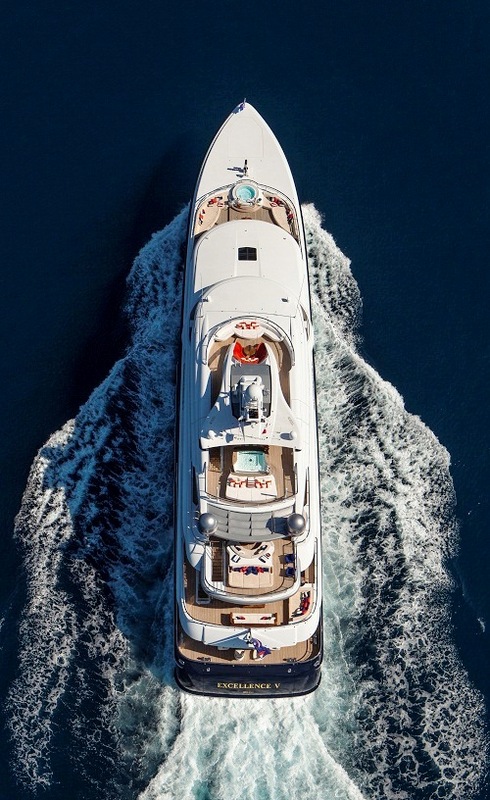 Motor Yacht EXCELLENCE V boasts a private foredeck for the master suite with ample sun pads, plenty of optional shade and a Spa Pool. 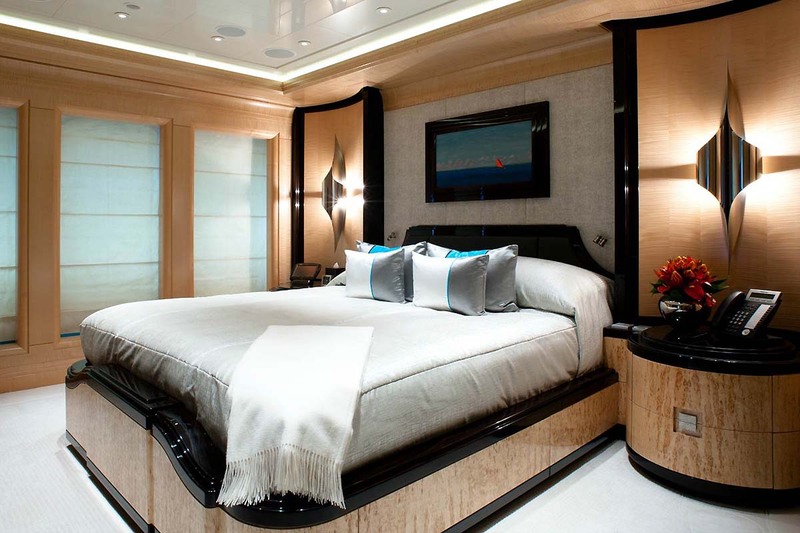 This yacht offers a king size en-suite guest cabin located to port of the master suite accessed via the master suite's private lobby. 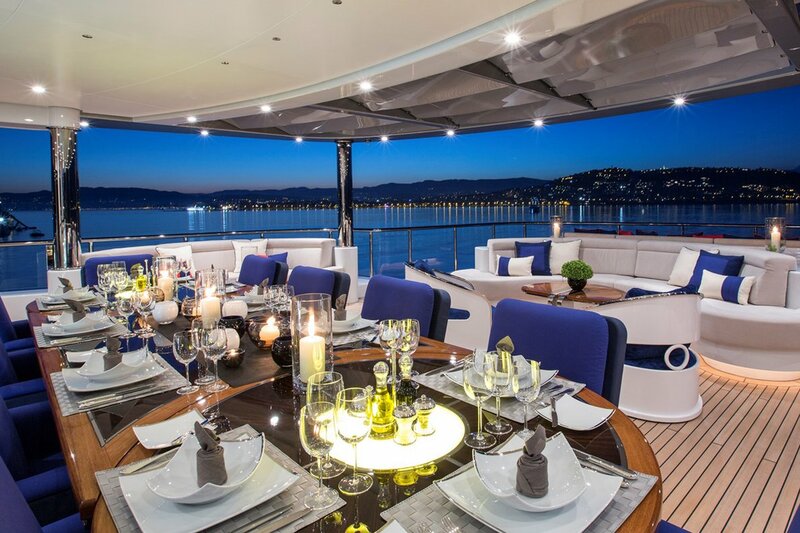 The bridge deck is expansive and partially shaded offering an alfresco dining option with endless views. 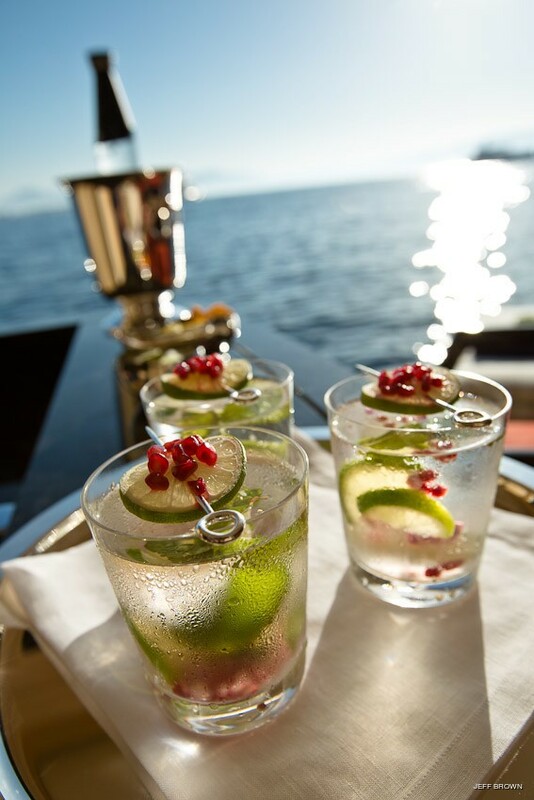 The beautifully appointed outdoor sports bar located forward of the al fresco dining ensures crisp cool drinks are on hand. 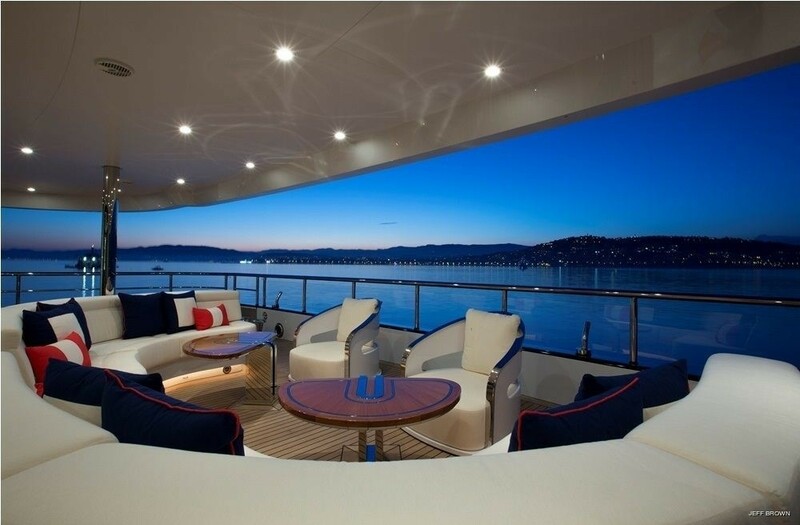 The comfortable outdoor lounge area is a casual space to enjoy a good book or entertain. 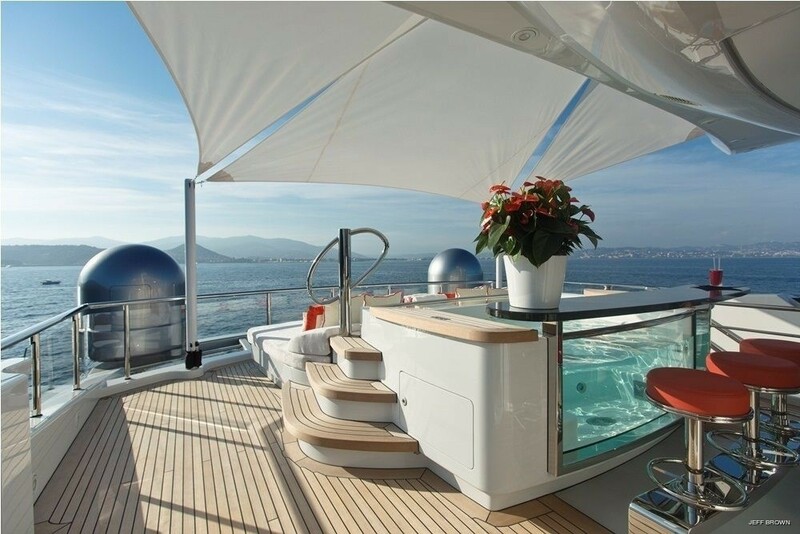 Further aft a large sunpad is ideal for sunning or simply watching the world go by. 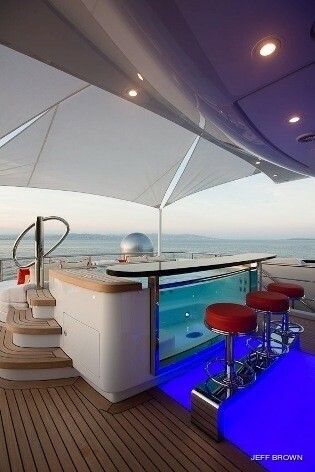 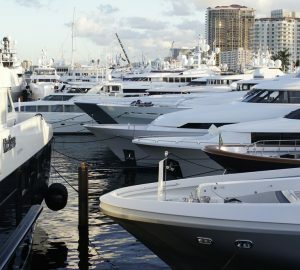 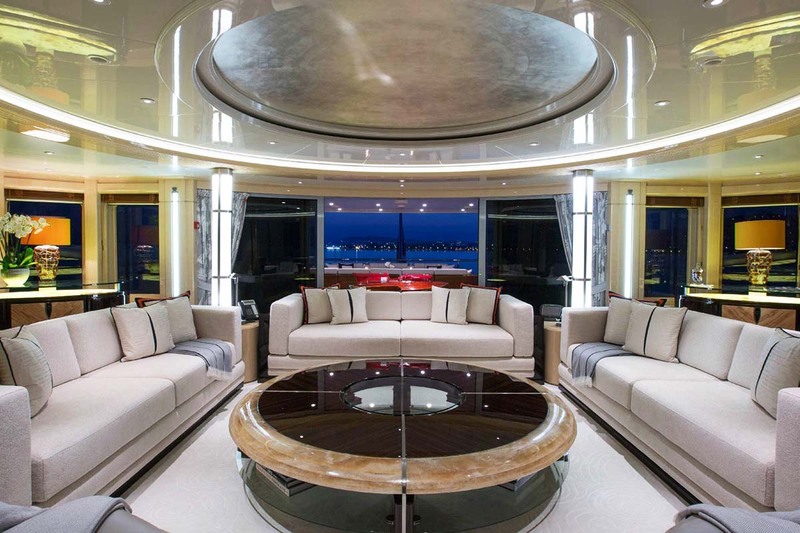 Luxury motor yacht EXCELLENCE V features a spacious sundeck. 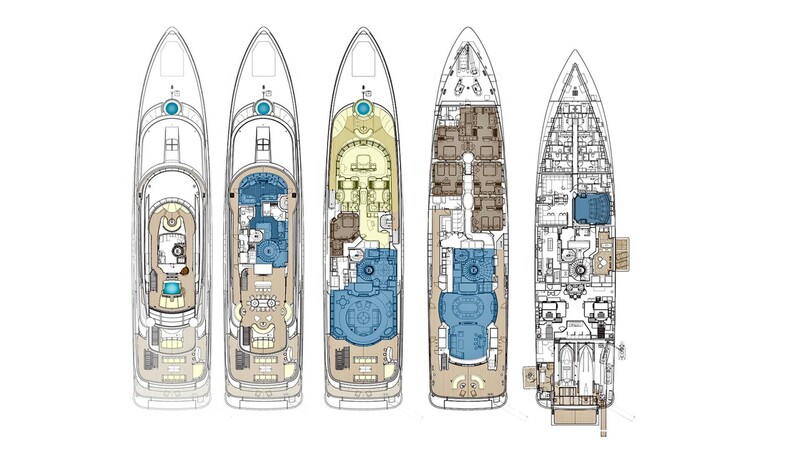 The layout is both unique and incredibly well thought out. 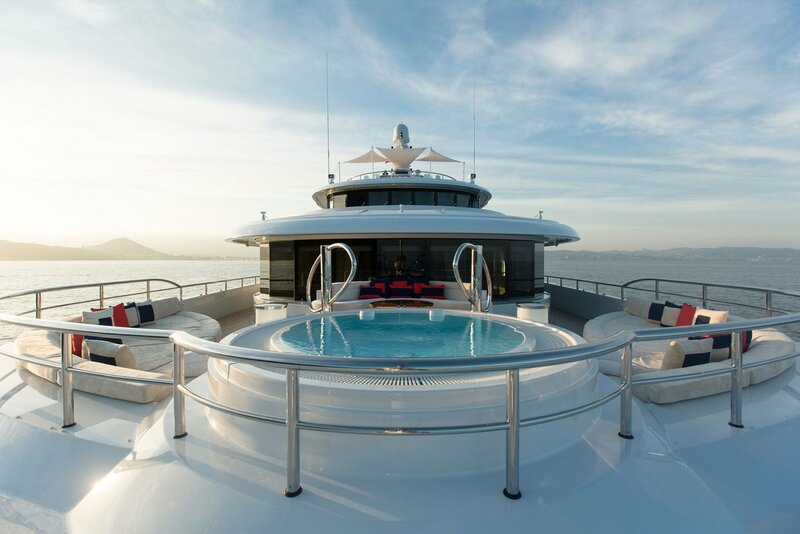 A Spa Pool tub with glass front, bar top and infinity waterfall backdrop, and fitted exterior seating is perfect for all to enjoy. 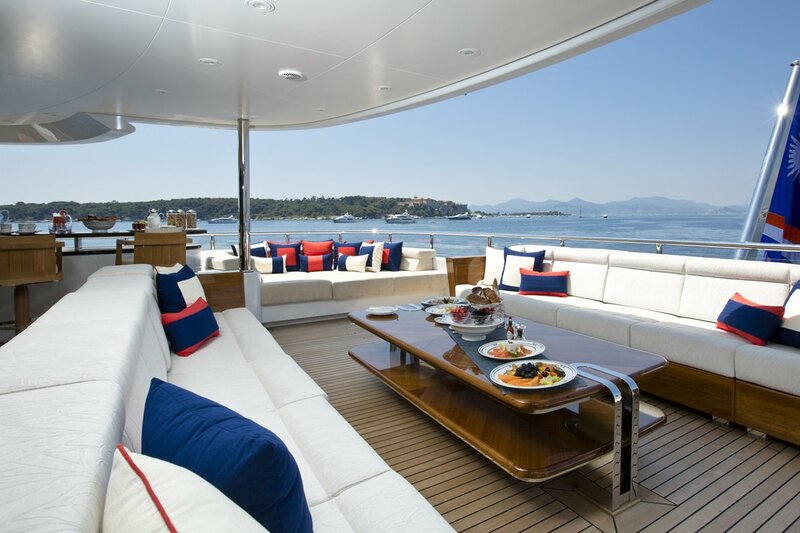 Large sunpads both fore and aft, plus a cocktail seating area give guests plenty of relaxing options, while removable sun shades ensure ultimate comfort. 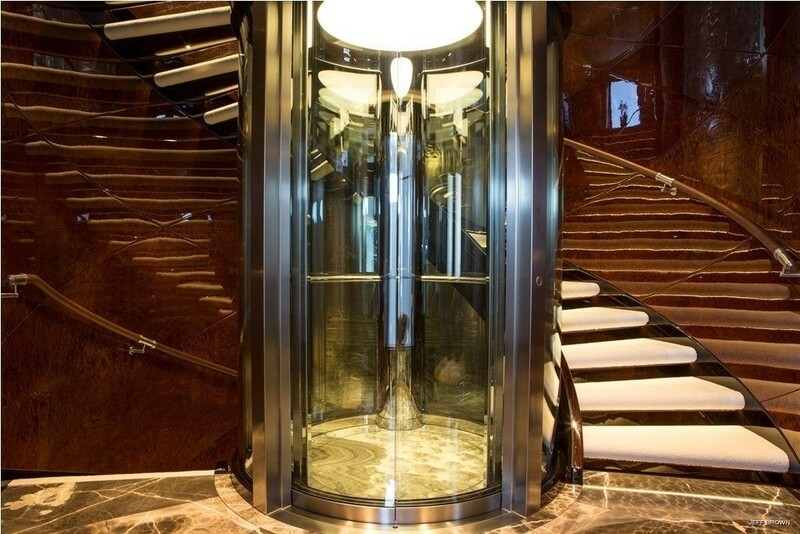 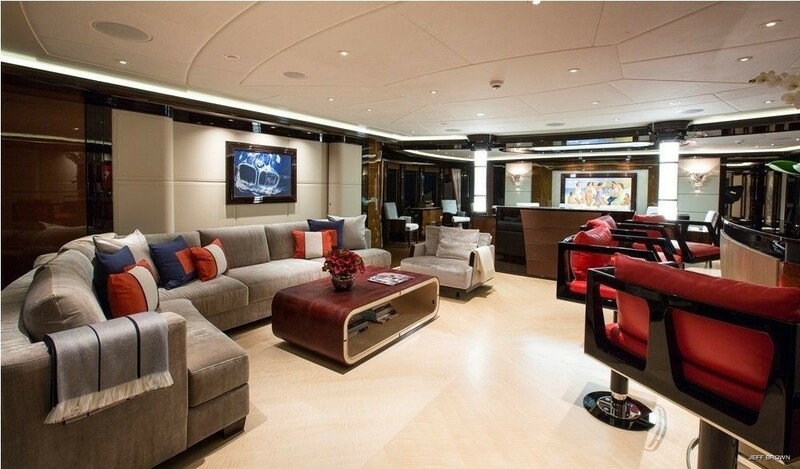 EXCELLENCE V has further entertainment areas below decks. 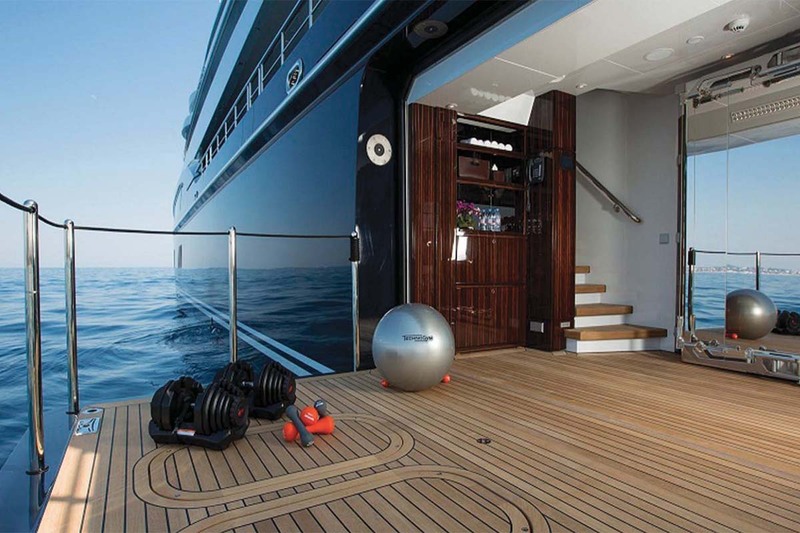 There is a fitness gym with fold-down balcony, full wall mirror and powder room/shower on her port side with access to the main deck and aft deck. 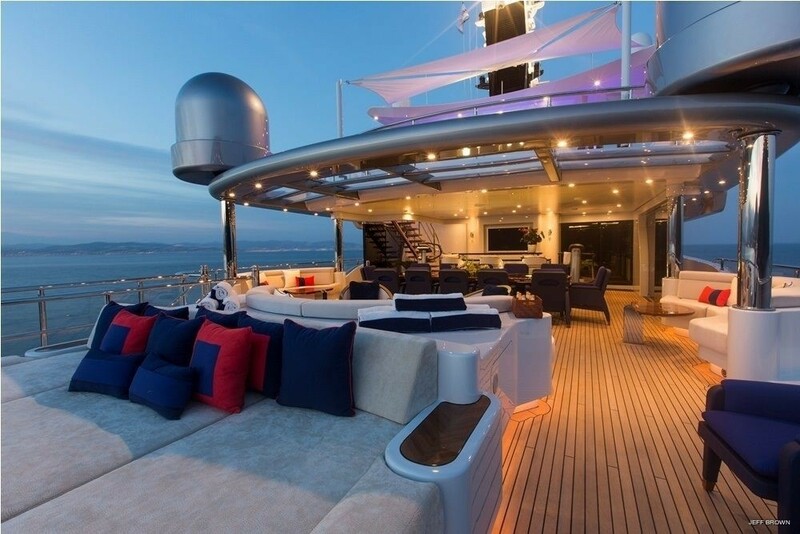 On the starboard side amidships lower deck, a beach club terrace folds out complete with plush seating, wet bar and access to the main deck. 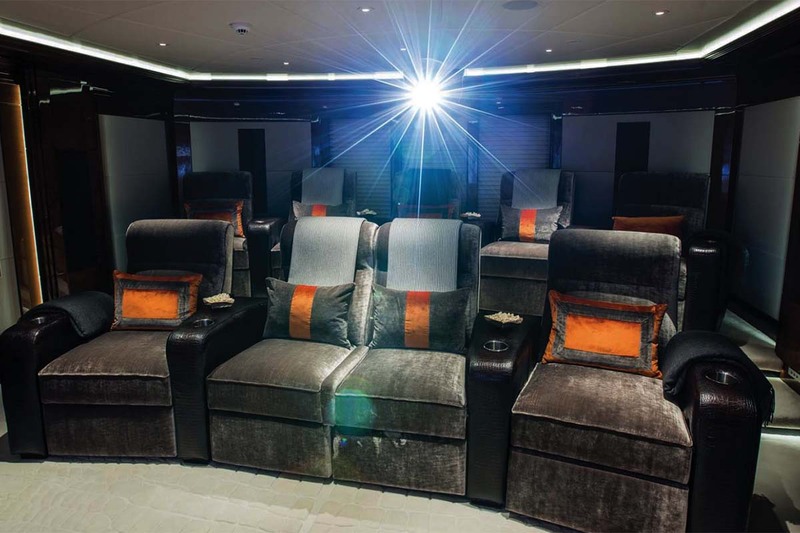 A full cinema is fitted with the latest technology and state of the art amenities just forward of the beach club, with shared powder room. 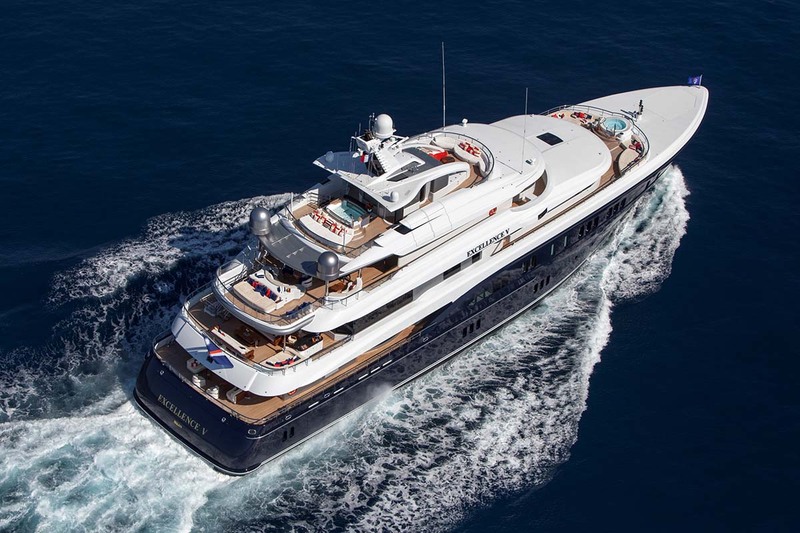 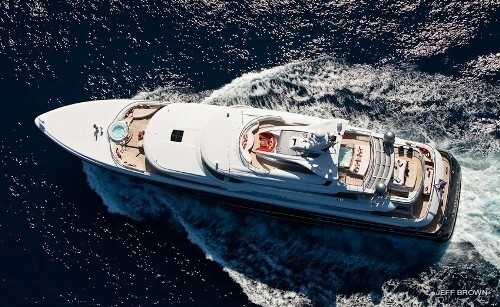 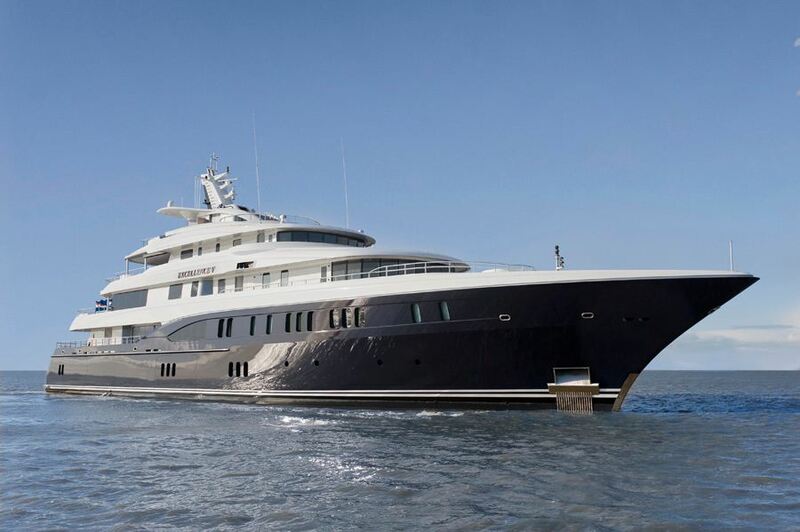 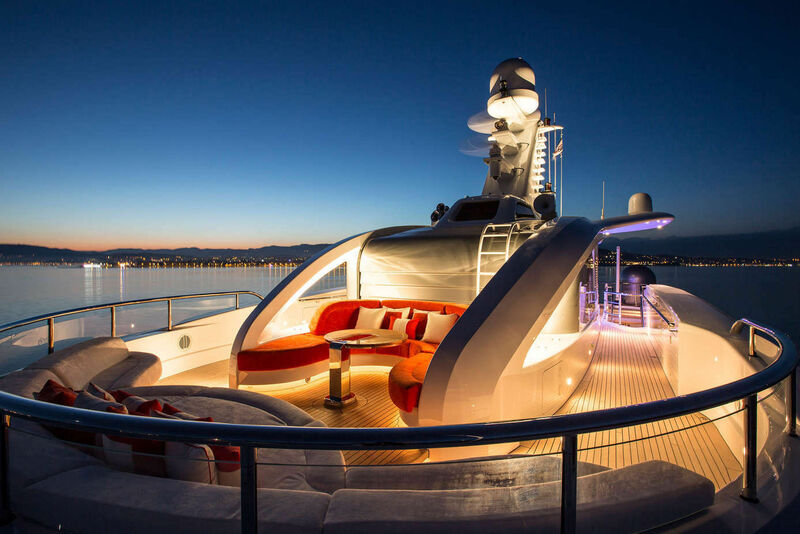 Superyacht EXCELLENCE V accommodates up to 12 guests in 7 stylish cabins. 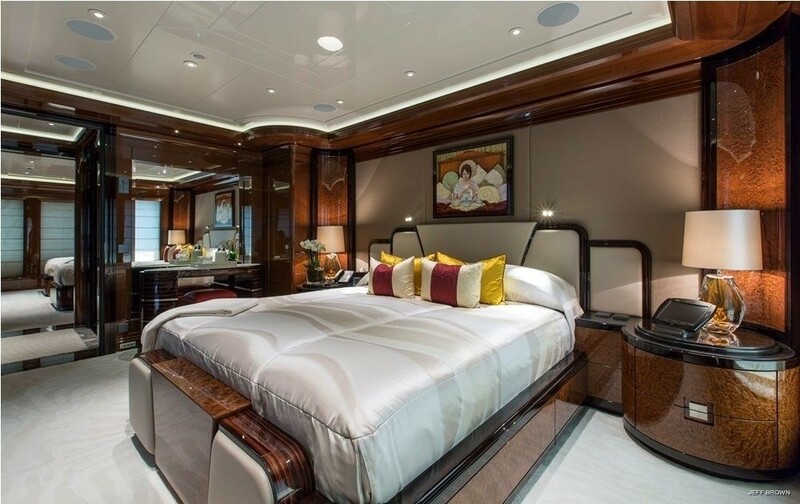 The master suite is forward on the upper deck via a private lobby boasting a king size center lined bed, 180 degree panoramic views, his and hers marble en-suite facilities, separate study and private forward facing balcony complete with ample sunpads and Spa Pool tub. 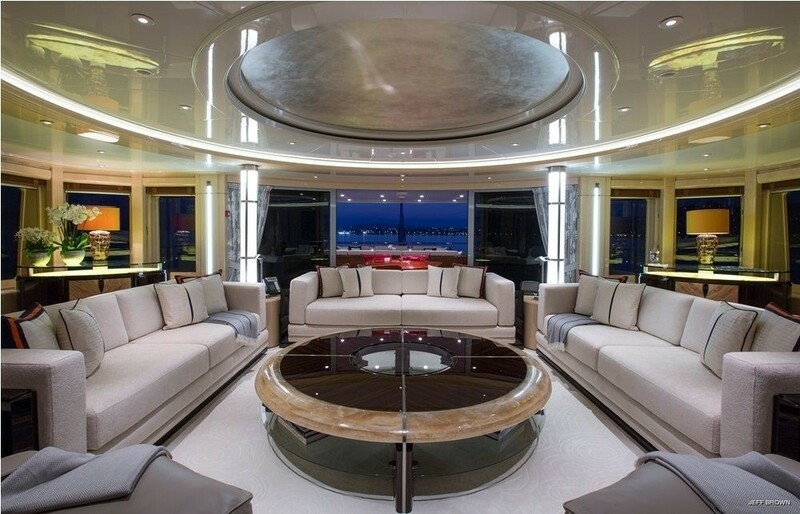 The décor is light and welcoming, featuring neutral creams and natural woods, the use of dark wood to accent the light gives the space a feel of elegance and structure. 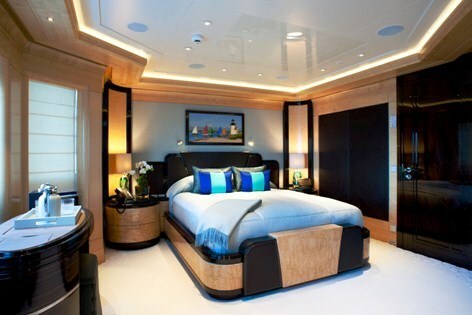 Port on the upper deck a guests cabin is adjacent to the master suite accessed from the private lobby. 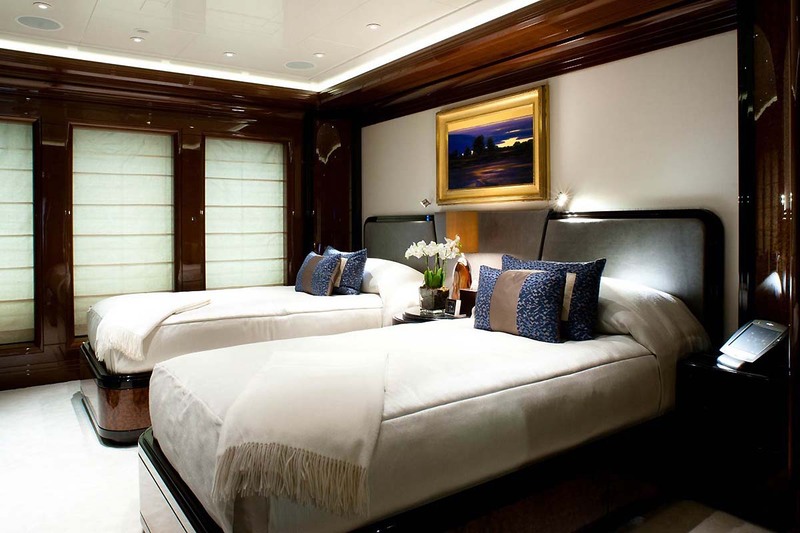 The cabin offers a king size walk around bed, vanity and en-suite facilities with shower. 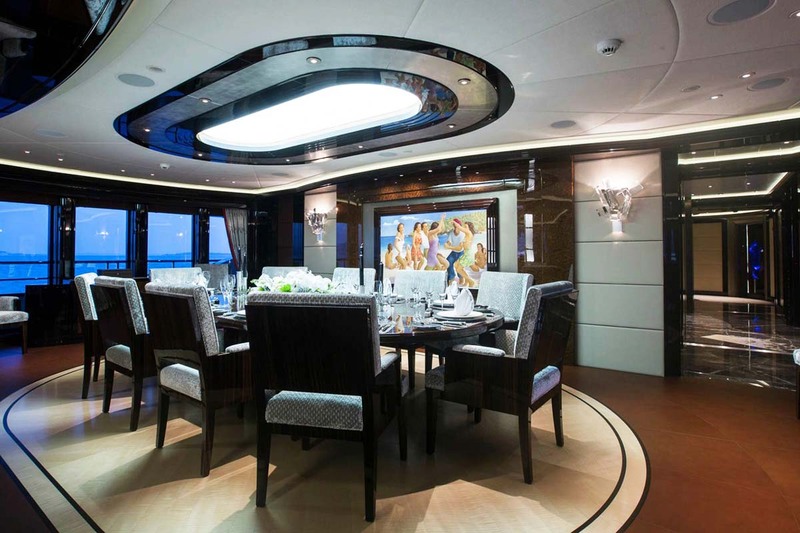 All other guests cabins are on the main deck forward of the salon and dining, thus giving guests ample space to enjoy and allowing each cabin to receive plenty of natural light. 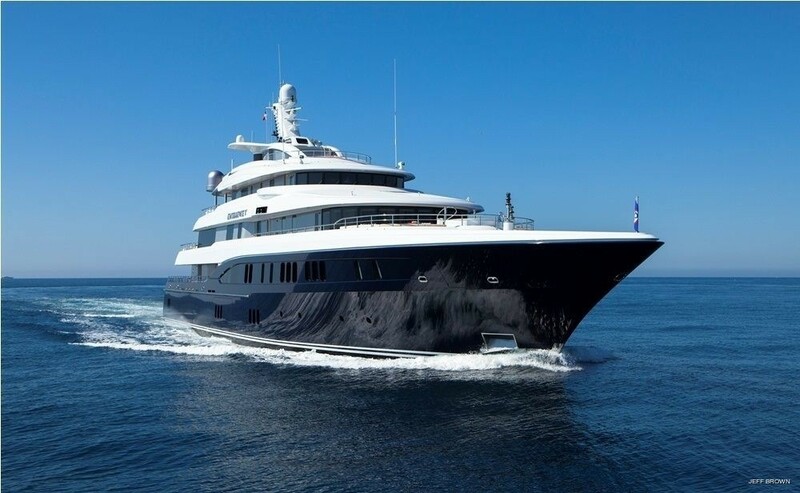 Starboard and forward of the foyer is a twin cabin with 2 single beds, vanity and en-suite facilities with shower, followed by a double cabin forward with walk around king size bed, vanity and en-suite facilities with shower. 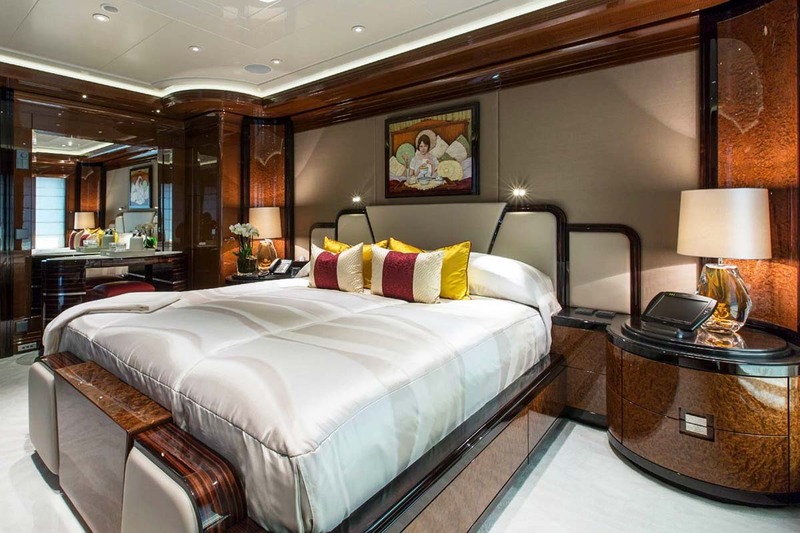 Further forward the VIP cabin boasts a king size walk around bed, a full length mirrored wall, vanity, walk in closet, en-suite facilities with Spa Pool tub and shower. 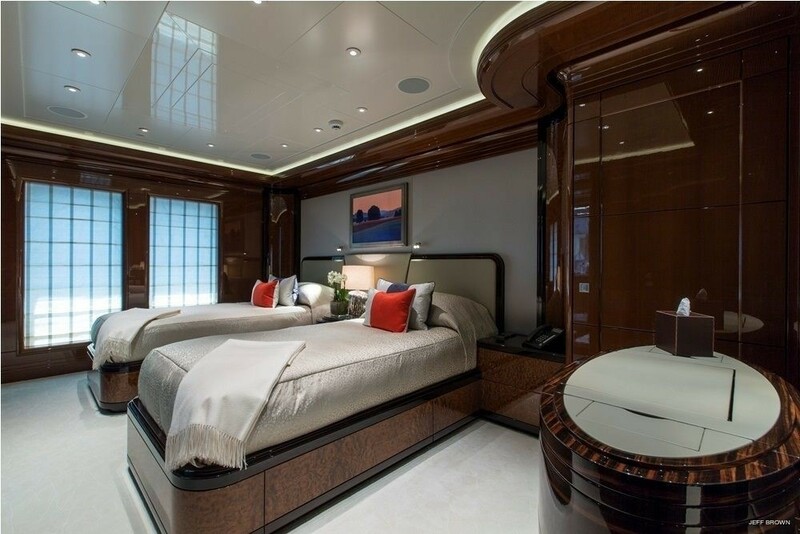 Port forward a large cabin features a king size walk around bed, vanity, walk in closet and en-suite facilities with a Spa Pool tub and shower. 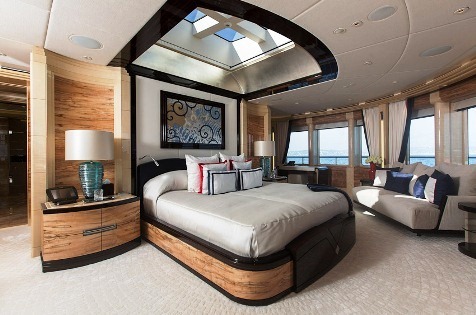 A further guests cabin is port featuring 2 single beds, vanity and en-suite facilities with shower. 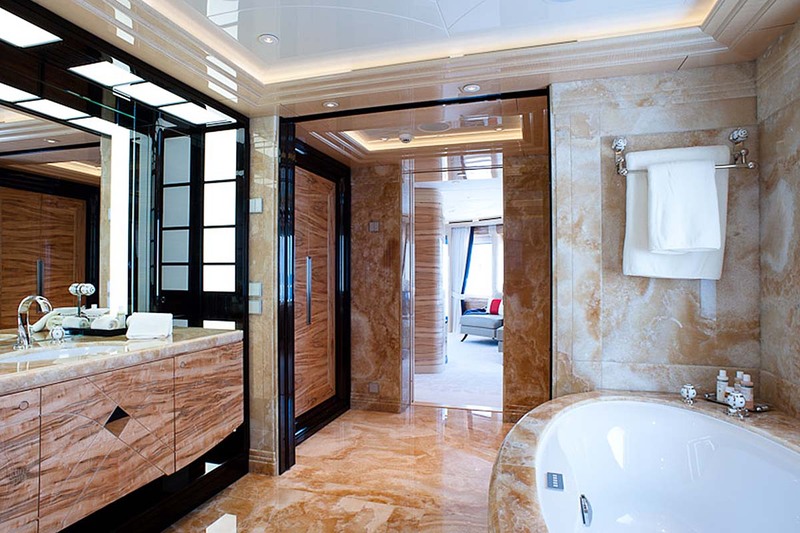 Each cabin offers his and hers sinks in fine marble, the cabins’ décor is refined with an elegant touch, yet contemporary in feel, creating a deluxe and serene ambiance. 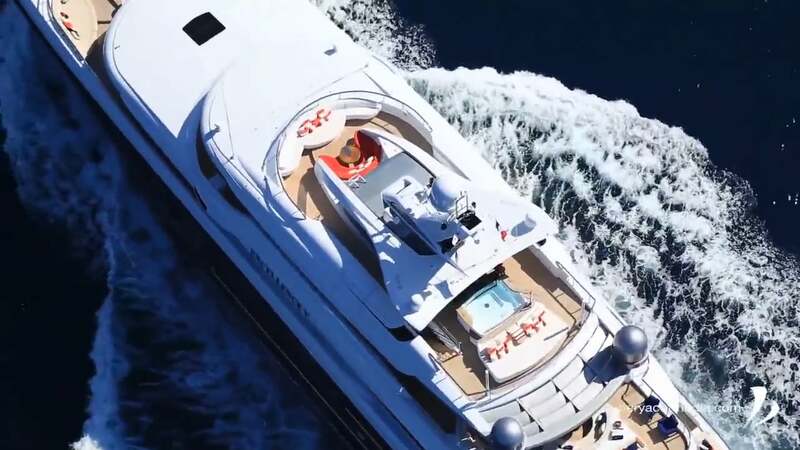 Amenities and extras onboard the EXCELLENCE V yacht include a 27ft (8.22m) Novurania Chase 450hp inboard diesel, 23ft (7m) Novurania Chase w/ 350hp inboard diesel, 2 x 2 person wave runners, 2 x Hobie Quest Kayaks, 1x Sea bob, 2x paddle boards, Snorkel gear, Various inflatable and towable toys, SCUBA: 4 x Full sets gear, compressor (Rendezvous only), Beach tents & chairs, portable BBQ, Spa Equipment: Massage table, stone warmer, towel warmer for facials, pedicure/manicure (Services arranged from ashore at Charterer's expense),Board Games, Playing Cards, DVD Library with 700+ titles, Zero Speed stabilizers at anchor. 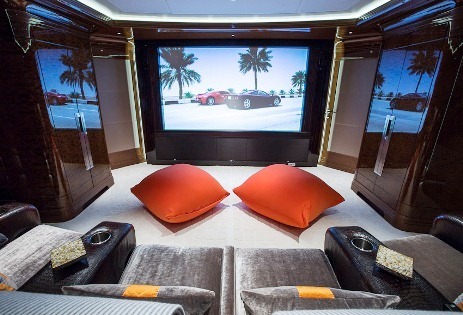 Gym, Treadmill, Free weights, Sauna, Cinema, TV, SAT TV, Wi-Fi.